If you live in The South like me, your summer is quickly winding down. I go back to work August 1st, and my kiddos come August 7th. It's time to kick BTS into high gear! 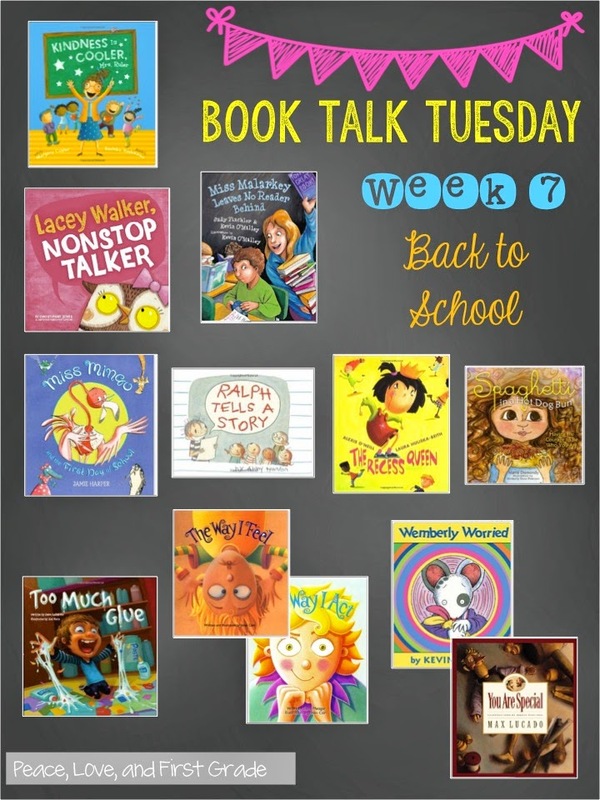 This week's Book Talk is dedicated to Back to School! Chrysanthemum thinks her name is the most wonderful name ever! That is until the kids at school make fun of her. Find out how she learns to love her name again in this perfect book for Back to School! This book is the story of a silly rabbit who becomes anxious when the otters move to town. Wise old Owl teaches him how to be a good friend and neighbor. Hilarious! Oh, tattling! What is it with kiddos and tattling? The little piglets in this book learn what's important to share and what's tattling! As a big fan of pigs, I love this book! Julia Cook's books are wonderful!! in this story about making new friends. Sarah Jane is afraid to go to school on the first day. She isn't like most school children, though. Find out what happens to SJ in this book. Henry isn't sure he's ready for First Grade. Find out how he does in this charming little book. I love Henry and Nancy Carlson books. All summer long, Aidan has had "the jitters" about entering first grade. This book addresses the very real fears children have about starting school. 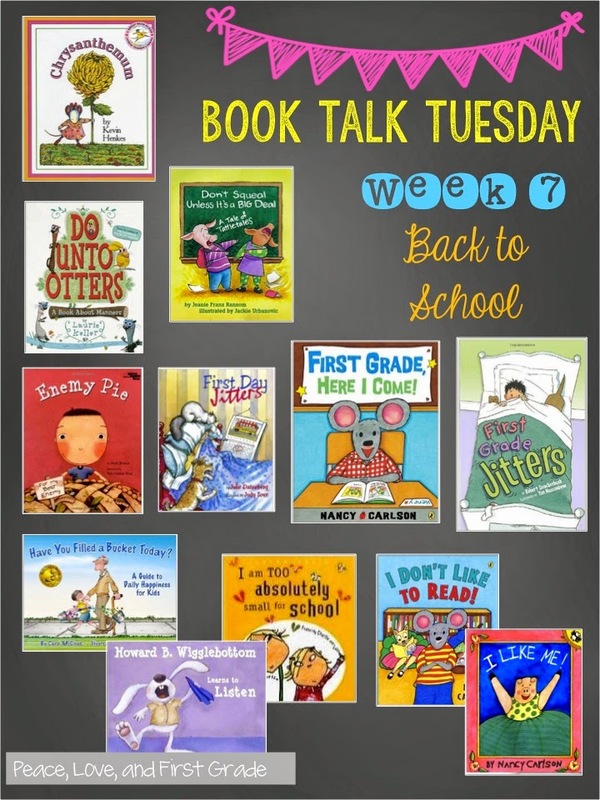 The bucket filler books are great assets for any classroom. Bucket filling encourages kindness and appreciation. If you've never seen them, find one soon! Howard B. Wigglebottom learns a lesson in each of these adorable stories. He learns about manners, sportsmanship, and courage. He also learns to listen. When Lola doesn't want to go to school, she gets help from her big brother Charlie. This sweet series is about the funny relationship of a brother and sister. Nancy Carlson's Henry is back! In this book, he likes everything about First Grade...except reading! When his teacher figures out why, he changes his mind! There is a plump and precious pig in this story! She is full of confidence and self-esteem! Another fun book by Nancy Carlson! Mrs. ruler teaches her class about the Golden Rule in this fun story! Lacey Walker LOVES to talk! In this book, Lacey learns the power of listening! Miss Malarkey is determined to find the perfect book for every student in her class. Miss Mingo is one cool teacher! In this cute book, her animal students share facts about themselves. Fun for Back to School and learning about animals. Ralph has nothing to write about, or so he thinks. His classmates help him overcome his writing anxiety. Good book to use with Writer's Workshop. Mean Jean was a bully at recess until she met her match. My kiddos love this book! Lucy is different than the other children and is often teased. Great book for celebrating differences! Matty loves glue and always uses too much! A funny book for teaching children how to properly use glue! This book explores the range of emotions we all feel at different times. Nice book for encouraging students to share feelings. Poor Wemberly worries about EVERYTHING! The perfect book for anxious kiddos! Kevin Henkes is a great author study! I love Max Lucado's precious books. In this sweet story, the Wemmicks judge one another with gold stars or gray dots.